(Bloomberg) -- China’s economy is showing further signs of recovery after months of slowdown, though downward pressures still persist. 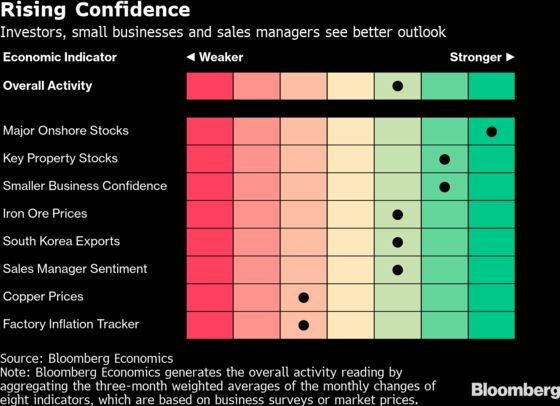 That’s according to a Bloomberg Economics gauge aggregating the earliest available indicators on market sentiment and business conditions. Stocks and smaller business sentiment led the gains, while a trade gauge and a sales manager survey signaled a broader pickup. At the same time, copper prices and factory inflation pointed to weakness. To cushion the economic slowdown, the government has been directing credit toward smaller businesses and this month announced the biggest tax reduction on record. News that China and the U.S. are closing in on a trade deal also offers reasons for optimism, though a grim outlook for global commerce is a lingering basis for caution. The economy is still some “distance from a self-sustaining recovery where policy-induced stabilization takes hold,” said Bloomberg China economist David Qu. “Government-led investments will play a more important role in stabilizing the economy." “The relatively strong fiscal stimulus and monetary policy maintaining an easing bias will provide a buffer for the economy,” said Hunter Chan, Hong Kong-based China economist at the bank. He sees the economy bottoming out in the second quarter and rebounding in the second half. Onshore stocks extended gains this month as trade deal prospects fueled investors’ optimism, and iron ore prices also hovered at a high level. Outbound shipments from South Korea -- a major supplier of components to Chinese assemblers of electronics such as iPhones -- narrowed its year-on-year decline this month, signalling that the global electronics trade is at least not in a downward spiral. For the pessimists, the data won’t dispel all concerns. Copper prices and overall factory inflation don’t bode well for upstream manufacturers. The profit of Chinese industrial companies had the worst start to a year since the global financial crisis, with auto, oil processing, steel, and chemicals sectors seeing significant drops in earnings. “The disinflation risk is still there and we may even see PPI reaching negative territory,” Bloomberg’s Qu said.